Le Club AccorHotels has again launched their worldwide Private Sales for up to 50% off stays. The stay dates, discounts, and other terms are region specific. The offer is valid for bookings made between January 10 – 19, 2017, and the most sought after properties likely have their discounted inventory booked fast. You can access the Accor’s sale page for this offer here. A special discount of 40% applies for Pullman, Mercure, Novotel, Novotel Suites, Adagio and Adagio Access. A special discount of 30% applies for Sofitel, MGallery by Sofitel, Ibis, ibis styles, ibis budget and HotelF1. This offer can be booked from 10th to 19th January on AccorHotels Group websites for stays from 20th January to 5th March 2017. The special discounts are based on the Best unrestricted Rate. In Adagio and Adagio Access, a maximum stay of 9 nights applies. The payment of the stay is entirely deducted upon booking. No cancellations or changes are possible. The “3 for 2” discount (equivalent to a 33.33% discount) is only valid at participating hotels. Offer is subject to availability. Promotion cannot be combined with any other offer(s). Offer is valid for bookings made between 10th January 2017 and 19th January 2017 for stays from 1st February 2017 to 23rd April 2017, booked on AccorHotels.com only. The Private Sale offer “Germany, Austria and Sweden: Up to 35% discount” is valid for bookings from 10th to 19th January 2017 for stays from 20th January to 30th April 2017.The offer can only be booked on websites of the AccorHotels group (AccorHotels.com, ibis.com, mercure.com, novotel.com, pullmanhotels.com, sofitel.com, …). – Up to 35% discount for bookings in our Sofitel, MGallery by Sofitel and Pullman hotels. – Up to 25% discount for bookings in our Novotel, Novotel Suites, Mercure and Adagio hotels. – Up to 15% discount for bookings in our ibis and ibis Styles hotels. The basis of this offer is the “Best Flexible Rate”. The total cost of the stay is debited upon booking. The booking cannot be changed or cancelled. In case of non usage: Earnings from a substitute accommodation contract, as well as saved expenses will be deducted. This offer is subject to the availability at participating hotels in the action. Members of our loyalty program “Le Club Accorhotels members” can earn points with this offer. Offer valid for all bookings made between January 10th and January 19th 2017 on All AccorHotels group Websites for all stays of 2 consecutive nights between March 17th 2017 and August 31st 2017. This offer can be booked from 10 January 2017 to 19 January 2017 on AccorHotels Group websites (accorhotels.com, ibis.com, novotel.com, mercure.com, …). For staying dates, please see below each country’s sales conditions. The special discounts (from 20% to 40%) are based on the best unrestricted rate and are valid only in the participating hotels. The payable amount is entirely deducted upon booking. No cancellations or changes are possible. This offer is subject to availability in the participating hotels. This offer cannot be combined with any other offer(s). Le Club AccorHotels members can accumulate points with this offer. The “up to 50%” discount is only valid in participating hotels. Offer valid for booking from 10/01/2017 to 19/01/2017 for stays from 01/02/2017 to 31/07/2017 in the Middle-East and Africa/ bookable only on AccorHotels’ websites. The up to 50% discount is based on the lowest unrestricted rate. For staying dates: From February 1st 2017 to July 31st 2017. This offer can be booked from 10th to 19th January, 2017 at Accorhotels.com. See the arrival dates at the sale. Special discounts are based on the best unrestricted rate (rate without conditions). Based on availability of the participating hotels. This promotion is not combinable with other offers. Private Sale in North America, Central America and Mexico! This offer is valid until January 19th 2017 for stays from February 2nd 2017 to June 30th 2017. Save up to 40% off a minimum 4 night stay at Novotel Toronto Centre, Novotel Toronto North York, Novotel Montreal Aeroport and Novotel Mexico Santa Fe; a minimum 5 night stay at the Novotel New York Times Square; a minimum 4 night stay at Sofitel Washington DC, Pullman Miami Airport and Novotel Toronto Mississauga; a minimum 3 night stay at the Sofitel New York, Sofitel Chicago, Novotel Toronto Vaughan and Mercure Casa Veranda Guatemala; a minimum 2 night stay at the Sofitel Philadelphia, Sofitel Los Angeles, Sofitel Montreal and Novotel Monterrey Valle; a minumum 3 night stay at ibis and ibis Styles hotels in Mexico. Blackout dates apply. Offer subject to hotel’s sales conditions. Full deposit is not refundable even if the booking is cancelled or modified. Full amount of stay is payable in advance by credit card at booking time. Client must provide credit card details to qualify for this promotion. No change or cancellation can be made after booking. Taxes not included. Surcharges apply for 3rd & 4th adults. Other hotel conditions may apply. – 17 February to 30 April 2017 for the rest of Asia. Bookings are payable at time of reservation and are non-exchangeable, non-refundable and non-transferable. No cancellations or changes are possible. The special discounts (40%) are valid at participating hotels only and are subject to each hotels’ conditions and availability. This offer can be booked from 10th to 19th January 2017 on AccorHotels Group websites. The special discounts are based on the Best Unrestricted Rate and apply to stays for all hotels between 01 March 2017 to 30 June 2017. A 2 night minimum length of stay applies at participating hotels across Australia. To confirm your booking, the non-refundable payment of the stay is entirely deducted upon booking. To the extent permitted by law, no cancellations or changes are possible. This promotion cannot be combined with any other offer(s). Le Club AccorHotels members can accumulate points with this booking. Accor Plus Members receive an additional 10% discount on this promotion. The discount is only valid in participating hotels. Offer valid from 10th January until 19th January 2017 for stays from 20th January 2017 to 10th April 2017, booked on AccorHotels Group websites. The discount is based on the lowest unrestricted rate. 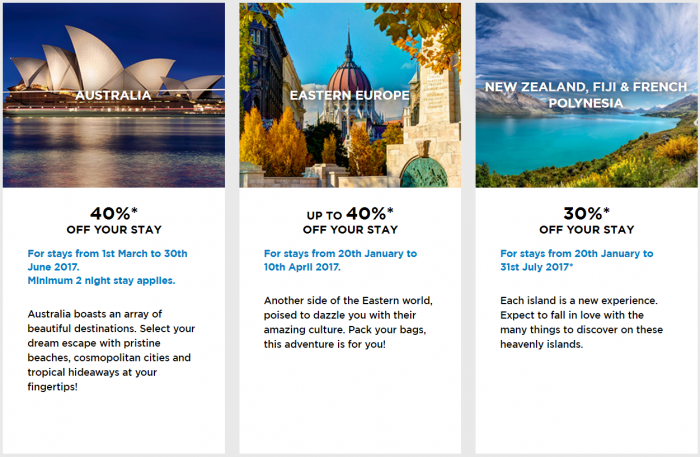 The special 30% discount is only valid in participating hotels across New Zealand, Fiji and French Polynesia. – 17 March 2017 until 31 July 2017 in New-Zealand. The special discounts are calculated based on a 30% reduction on the best unrestricted rate available each day over the chosen stay period. Le Club Accorhotels members can accumulate points with this booking and Accor Plus members receive 10% additional discount. Discount up to 40% per night valid only on the participating hotels in South America. For selected ibis and ibis Styles hotels: 30% discount per night for AccorHotels.com subscribers and Le Club AccorHotels members. For Sofitel, Pullman, Grand Mercure, MGallery by Sofitel, Maksoud, Caesar Business, Mercure, Novotel hotels and Adagio aparhotels: 40% discount per night for Accorhotels.com subscribers and Le Club AccorHotels members. Offer valid for bookings made between January 10th and January 19th from 2017, for stays between February 1st and April 30th from 2017, booked trough this link only. The discount up to 40% per night is based on the Best Price Without Conditions. Le Club AccorHotels members can earn points with this booking. Le Club AccorHotels tend to offer their lowest rates during these sales. The only drawbacks are that these rates are prepaid, nonrefundable and non-cancelable. It is definitely worth having a look at the prices offered and book if they are good enough. Remember to check all the promotions that are going on right now to earn bonus points for your stays as well. Next articleReader Question: Delta Flight Delay Causing Passenger To Arrive 7 Hours Late?